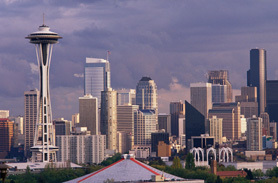 Seattle is known as “the Emerald City." Seattle sits on the shores of two large lakes and Puget Sound, with remote wilderness less than an hour away, and it is flanked by two major mountain ranges, with Mount Rainier in full view from the city. Sightseeing and restaurants (more than 2,200) make this city one that never bores you, and despite the stigma of rain and clouds, the average annual rainfall is only 36 inches, less than New York and Atlanta! Old Seattle-style upscale establishment specializing in seafood and steak. One of Seattle's gems, Chez Shea offers a romantic setting overlooking Puget Sound. Expensive, but worth it. Amply portioned but formulaic Northwest seafood, with an outstanding view and near-waterfront location. Have a great meal overlooking Elliot Bay, the tasty food is not too pricey, either- especially with the view! Mild, medium or hot barbecued meat sandwiches and chili in a real hole in the wall. The intimate space under the Market is a perfect backdrop for enjoying food, wine and friends. A New York-feeling steakhouse with reading materials, a long bar and great happy hour specials. Brilliant Southeast Asian cuisine has made a lasting mark on the city's restaurant scene. In 1959, Edward E. Carlson penciled his vision of a dominant central structure for the 1962 Seattle World's Fair on a placemat in a coffeehouse. That futuristic image would become the internationally known symbol of Seattle, the Space Needle. Just 43 seconds in a glass elevator from ground level to 520 feet above Seattle. There are a couple of good restaurants at the top, or you can just have a drink and watch the world go round. Great views!. The world's only dedicated powerboat racing museum, featuring hydros dating to 1929. First-class museum of aviation history, with vintage planes hanging overhead. >>Search Pollstar for live music in Seattle!